The Global Resource Center in Gelman Library is now open for graduate students to use as a study space. Graduate students now have more study space to themselves on campus. The Global Resource Center in Gelman Library is now open for graduate students to use as a study space. 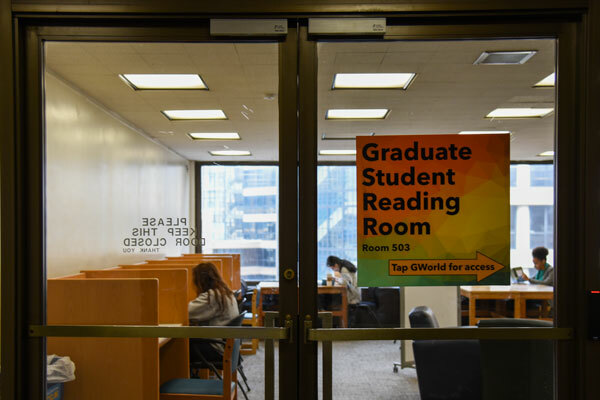 This is the second addition to Gelman in the past two years for graduate students – a student population that has historically complained about a lack of space on campus. To access the seventh floor room, students must tap their GWorld cards. Only graduate students’ cards can open the door after the room’s regular hours. Geneva Henry, the dean of libraries and academic innovation, said in an email that graduate students gained access to the room for late-night and weekend hours after both the Student Association and individual students said graduate students needed their own space on campus. Henry did not provide details on the renovation, including when it took place and how much it cost. Sen. Brady Forrest, CCAS-G, and Sen. Lacey Bruske, G-at large, said in an email that graduate senators have been discussing graduate study space in Gelman. Last year, a study room on Gelman’s third floor was also designated for graduate students. The library’s entrance floor was renovated in 2013 to add more computers and a multimedia center. Elizabeth Boling, the associate dean for graduate studies at Indiana University, said graduate students often have demands outside of academics, like families or jobs, that can add stress on top of classes. “I feel as though this leads very often to them having a need for quiet places to work where they can psychologically and physically get away from those demands so that they can focus on their scholarship,” Boling said. Boling added that it’s important for graduate students to “break out of their isolation” and work together with other graduate students. “When you put these two things together, the external demands and the isolation of graduate studies, this is where a lot of the needs come from,” Boling said. This article appeared in the April 18, 2016 issue of the Hatchet.